While going through some boxes a few weeks ago, I ran across a children’s story that I started writing years and years ago. 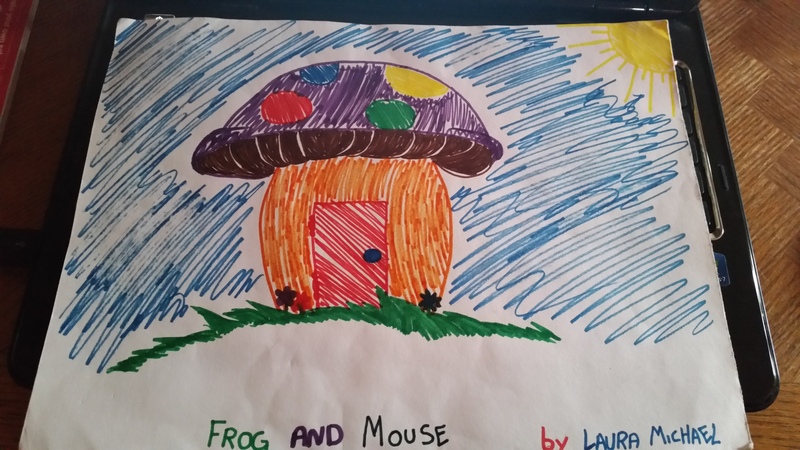 While the characters are a little unimaginative – a frog and mouse are friends – I still like the idea and feel like I could take these two friends through so many different adventures and create a fun and wonderful world for kids to explore. I’ve always liked the idea of writing children’s books – I LOVE checking out this genre whenever I go into a bookstore. I inspect the flow of words, the artistry, the pictures themselves (do they tell the story without the words??) , is it a fun and engaging story for even the adult who is reading it to enjoy? When I find one that hits all of these marks for me, I get excited and have to show whoever I’m with (my mom gets it a bit more, my OH doesn’t quite understand the importance of it, heh). Pumpkin Soup by Helen Cooper – three friends- cat, squirrel and duck live in the woods and make their soup the same way everyday. but one day, duck wants to stir the soup instead of adding the salt and a terrible fight ensues. When duck leaves in a huff, his friends begin to worry about him. A Pipkin of Pepper by Helen Cooper– you didn’t really think I was past these books by helen cooper did you??? Once again, the three friends have a soup problem, they are out of salt! They travel to the city to buy some but duck gets into trouble when he stays at the pepper shop too long and gets left behind. What follows is a delightful tale of cat and squirrel searching for him and finding him. i love the way they get back home too. Benjamin’s Balloon by Alan Baker – Benjamin blows up a balloon and so begins a traveling adventure that causes him a certain amount of worry. i want to read it now, don’t you?? There you are, folks, a completely-unplanned list of some of my favorite picture books. What are some of your favorite children’s books? Are any of you also slightly obsessive about this genre? Oh yeah…I share a slight obsession here. Here are some of my (and my kids’) favorites. I’ve read them out loud for 25 years and am excited to get to reread them to my granddaughter. Ask Mister Bear, Angus And The Cat, The Story About Ping (Marjorie Flack); Millions Of Cats (Wanda Gag), Blueberries For Sal, Make Way For Ducklings (Robert McClosky); Ferdinand, Wee Gillis (Munro Leaf); Huge Harold (Bill Peet), Thy Friend Obadiah (Brinton Turkle), Mike Mulligan and His Steam Shovel, The Little House (Virginia Lee Burton); The Biggest Bear (Lynd Ward), Harry The Dirty Dog (Gene Zion), Mr. Rabbit And The Lovely Present (Charlotte Zolotow), Andy And The Lion (James Daugherty), Good Night Moon, Little Fur Family (Margaret Wise Brown), The Fire Cat (Esther Averill), Little Bear (Else Homelund Minarik), Rosie And The Rustlers (Roy Gerrard) and of course the Billy And Blaze books (C. W. Anderson). Corduroy is on my list too and I love Frog and Toad but my kids didn’t 😦 I’m going to check out Helen Cooper’s books. I’m so excited you shared your list with me! I am absolutely going to have to check these out! I can’t believe your kids didn’t like Frog and Toad! Augh! They are classics. I love when one of them (Toad?) gets sick and the other helps him get better, only to get sick!